6 Responses to "0.17 Tournament Results". I had a great time and got my first win ever during the tournament. I’m obviously playing on a whole lower level than a bunch of you, but even with that, I think DCSS is about the single best computer game there is. So thanks! Love the stats and graphs. Any chance of comparisons with older tournaments being added? The number and above all the skill of players competing for the crowns is a tribute to how much the game is loved. Hats off to the developers for doing things right; for fixing bugs and adding interesting new wrinkles to the game. I was Gaseous Cloud in the tourney, and though I did get 15 runes on my one win (Gozag was made for Mummy Gladiators, there’s a clue! ), there are some true wizards out there that achieved a very high level of mastery in the game. I’d like to see more development in the Sprint section one day and also a resurrection of “Defense of Zot” one day, if there can be any dev interest sparked in those endeavors. Thanks for all the hard work and excellent tournament. The graphs are very cool, I am a sucker for this. 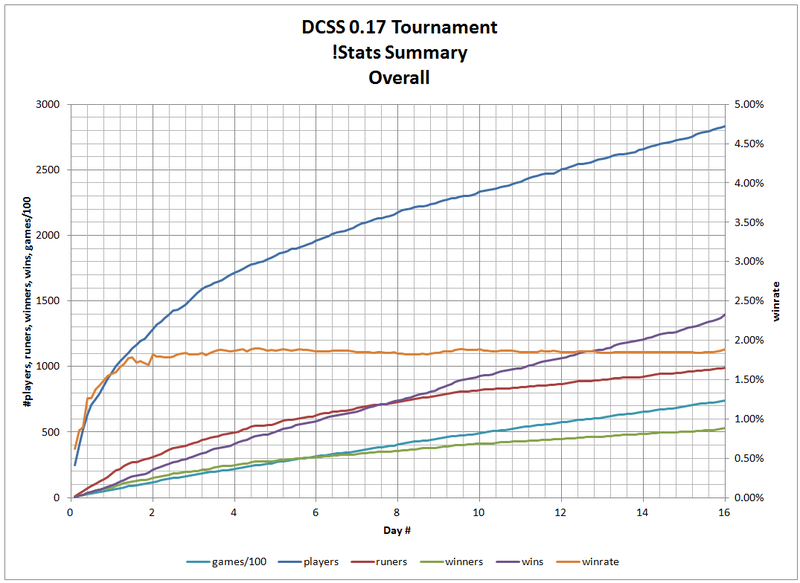 I think by now we even have enough data to get meaningful graphs across tournaments, i.e. one column for each tournament, across games, players, winners etc. Would be fun to look at! I noticed just today playing 0.17 on my Linux Mint computer that an old bug that has survived many a version, to the delight of my Ice Elementalists, has been, unfortunately, fixed. I had no plans to ever report that bug, but somebody else must have. I thought my secret competitive advantage was well-hidden. I don’t think it was quite enough to make Ice Elementalists a dominating force, but it definitely gave them an edge in the game’s beginning. I am impressed that even a well-hidden bug gets fixed, although it did survive several versions, there.